Every year, millions of children follows Santa Claus' journey around the world with the NORAD Santa Tracker, which uses military radar to track Santa's flight as he delivers gifts to all the good little boys and girls. The North American Aerospace Defense Command (NORAD) took over responsibility for tracking Santa in 1958. To this day, NORAD staff members, as well as family and friends, volunteer their time to help respond to children's calls, letter and emails and track Santa's flight each Christmas. 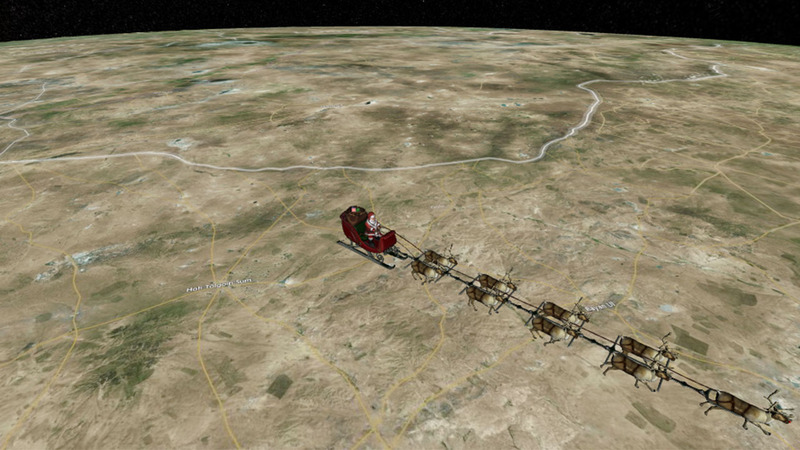 CLICK HERE to track Santa's journey using NORAD's Santa Tracker. But not everyone realizes that this popular Christmas tradition began with a typo in a Colorado newspaper ad. In 1955, Sears Roebuck & Co. ran an advertisement in a Colorado Springs-area newspaper with a phone number that children could call to speak with Santa. But rather than being a direct line to the North Pole, the misprinted number instead connected to a telephone on the desk of the Continental Air Defense Command's director of operations, Col. Harry Shoup. Terri Van Keuren, one of Shoup's daughters, recalls that red phone being an important one. "Only a four-star general at the Pentagon and my dad had the number," Van Keuren told StoryCorps when she and her siblings visited recently to share the story of how the Santa tracking program began. So when the phone rang one day that December, Shoup was surprised when a small voice on the other line asked for Santa. Although initially annoyed by the call, Shoup played along, his children told StoryCorps. When the calls continued, Shoup began staffing the line with airmen to answer for Santa. On Christmas Eve, the airmen added Santa's sleigh to the glass board the command center used to track flights over the United States. "Next thing you know, Dad had called the radio station and had said, 'This is the commander at the Combat Alert Center, and we have an unidentified flying object. Why, it looks like a sleigh. 'Well, the radio stations would call him like every hour and say, 'Where's Santa now?'" Van Keuren said. Shoup's children say he received letters from all over the world thanking him for having a sense of humor and starting a tradition loved by so many.